I picked this book up at the library on a whim, when I saw it lying on a table, and I am happy that I did. For such a short book, it gave me a lot to think about. 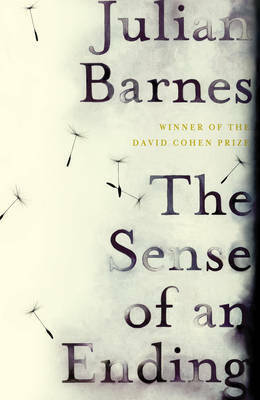 The Sense of an Ending won the 2011 Booker prize. Julian Barnes has written many other works of fiction, as well as short stories and non-fiction. Several other of his books have been shortlisted for the Booker Prize as well. But time… how time first grounds us and then confounds us. We thought we were being mature when we were only being safe. We imagined we were being responsible but we were only being cowardly. What we called realism turned out to be a way of avoiding things rather than facing them. Time… give us enough time and our best supported decisions will seem wobbly, our certainties whimsical. At the beginning of the story, Tony and his friends are young, not yet graduated from high school, but they feel worldly, wise, and ambitious. Their lives are all still ahead of them. Tony goes on to University and experiences life without his freinds, relationships with women, one in particular. At the time, he believed he is just living his life, he doesn’t think about things too deeply. After university, he travels to America. When he arrives home, he is greeted with some shocking news. I certainly believe we all suffer damage, one way or another. How could we not, except in a world full of perfect parents, siblings, neighbours, companions? And then there is the question, on which so much depends, of how we react to the damage: whether we admit it or repress it , and how this affects our dealings with others. Some admit the damage, and try to mitigate it; some spend their lives trying to help others who are damaged; and then there are those whose main concern is to avoid further damage to themselves, at whatever cost. And those are the ones who are ruthless, and the ones to be careful of. After he meets his wife, gets married, has a daughter, he lets life happen to him, until he realizes he is now in his 60s, divorced, with a grown daughter and a couple of grandchildren. He doesn’t regret his life, but has questions about how it all happened. Especially when something happens that takes him back to those high school and university years, and the memories he thought he had of his life. …what you end up remembering isn’t always the same as what you have witnessed. Also, when you are young, you think you can predict the likely pains and bleaknesses that age might bring. You imagine yourself being lonely, divorced, widowed; children growing away from you, friends dying. You imagine the loss of status, the loss of desire – and desirability. You may go further and consider your own approaching death, which, despite what company you may muster, can only be faced alone. But all this is looking ahead. What you fail to do is look ahead, then imagine yourself looking back from that future point. Learning the new emotions that time brings. Discovering, for example, that as the witnesses to your life diminish, there is less corroboration, and therefore less certainty, as to what you are or have been. In Adrian’s terms, I gave up on life, gave up on examining it, took it as it came. And so, for the first time, I began to feel a more general remorse – a feeling somewhere between self-pity and self-hatred – about my whole life. All of it. I had lost the friends of my youth. I had lost the love of my wife. I had abandoned the ambitions I had entertained. I had wanted life not to bother me too much, and had succeeded – and how pitiful that was. Sometimes I think the purpose of life is to reconcile us to its eventual loss by wearing us down, by proving, however long it takes, that life isn’t all its cracked up to be. 1. Are we meant to delve so deeply into the meaning, importance, mistakes, successes, and memories of our lives? Or does this only lead to confusion and discontentment, as it seems to have done with Tony? 2. What would this story have been like if the protagonist had been a woman? What would she have thought and discovered about herself and others? Would there have been similar thought processes and conclusions, or would the story have been completely different? This is in the 746 so thanks for your lovely review! I’ve never read Julian Barnes before and have been putting it off, but it sounds intriguing! I didn’t know anything about Julian Barnes going into it, but I ended up so happy that I read it. I would even like to read some more by him sometime, to see how it holds up to this one. Alas, I have read this but can’t remember enough to be able to answer well the good questions that you pose. It’s one of those books that I think I can appreciate more with a reread. I agree with you that you need to take your time with this one. It’s a short book, but so packed with questions to think about. I’m glad you enjoyed it! I didn’t realize it was so short. I might save this for Novellas in November! The book is 150 pages. What length does a book have to be to be called a novella? You liked Stoner, right? I will have to check it out!